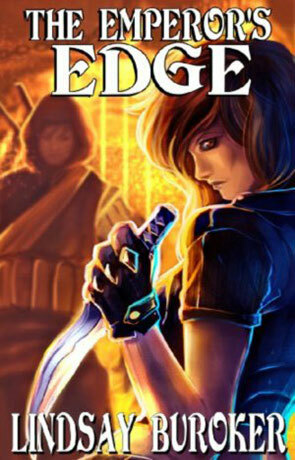 The Emperor's Edge is a speculative fiction novel by Lindsay Buroker. Amaranthe Lokdon is one of the first ever female watch officers in the city, she works harder than anyone else and yet is overlooked for promotion while others rise in the ranks around her. When ravaged bodies begin to show up on the waterfront, arson is used to cover up human sacrifices and a powerful business coalition plots to kill the emperor - she feels a tad overwhelmed. Worse still she is ordered to track down and detain or kill Sicarius, the most dangerous assassin in the Empire, showing either a seriously misplaced faith in her abilities, or someone is trying to get rid of her. The novel is placed within a steampunk-esque setting but blended with medieval, magical fantasy tropes, so we have steam driven coaches within a militaristic, monarchistic government and many 18th century trappings but with swords, armour and the occasional use of magic. This works a lot better than it sounds and much better than I thought it would thanks to the authors ability to build a believable and lively world filled with even more lively, engaging characters. The style is very distinct with a genuinely witty, dynamic prose that is very easy to read. The characters are great, from main protagonist's of Amaranthe and Sicarius to the many incidental people, all are written with intelligence and verve, really brought to life on the page. Sicarius has to be my favorite, a dark and dangerous assassin that will kill you faster than you could blink but none the less is shown to have a code of honour all his own and a small glimpse of humanity buried deep under a cold hard exterior. The plot is fast paced with a captivating, inventive and rewarding story that has you hooked right up to the very end, although I guessed some of the outcome there were genuine surprises and a real sense of tension building towards the climax of the novel. I would very much like to see further development of these characters (especially Sicarius) and do hope that the author chooses to continue the story. The Emperor's Edge is an imaginative journey through a luminous and beguiling world, recommended. Watch out soon for a review of Lindsay's second novel - Encrypted, a stand alone story set within the same world as The Emperor's Edge. Written on 2nd April 2011 by Ant.